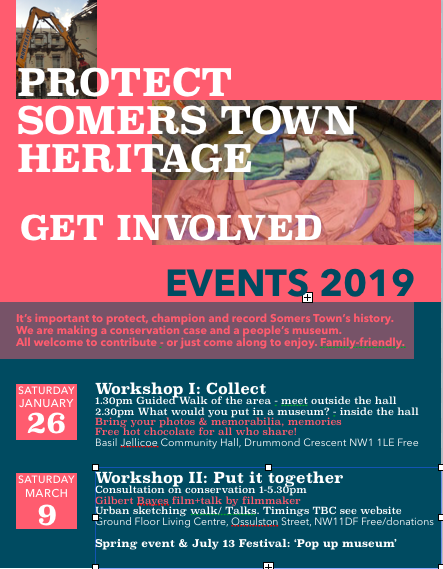 We’re kicking off an exciting campaign of conservation for Somers Town. We have two events coming up to put together information on our history for a conservation case and museum. This will form part of an Festival display. Two Saturday workshops – all welcome. 1.30pm Walk to identify key historical features – take photos and share. Meet OUTSIDE the Basil Jellicoe Community Hall at 1.30 sharp. Walk led by Slaney Devlin. 2.30pm Discuss and share INSIDE The hall. Computers available with Colouring London map of Somers Town. Bring your photos & memorabilia, memories – Free hot chocolate for all who share! Workshop II March 9th Gilbert Bayes and other talks and films.